A top of the line corporate jet can cost a company up to $35 million. But a new study shows that when chief executive officers trade in first-class commercial tickets for private planes, the cost to shareholders can be far greater. ersonal aircraft use represents by far the most costly and fastest growing fringe benefit enjoyed by chief executive officers of major corporations. In 2002, more than 30 percent of Fortune 500 CEOs were permitted to use company planes for personal travel, up from less than 10 percent a decade earlier. Several factors have contributed to this growth. The rise of fractional aircraft ownership has dramatically reduced the up-front costs of access to corporate jets. And in the wake of the September 11, 2001 terrorist attacks, many executives have chosen to escape the hassles and perceived danger of flying on major airlines by using private jets. Corporate jets regularly inspire criticisms of managerial excess by journalists and shareholder activists, and they frequently seem to symbolize corporate cultures of excess. At Adelphia Communications, the bankrupt cable company whose top executives have been convicted of fraud, prosecutors charged that the company jet was used to ferry corporate founder John Rigas to Kenya on a safari and to deliver a Christmas tree to one of Rigas’ daughters. At Enron, according to Bethany McLean and Peter Elkind, authors of The Smartest Guys in the Room, members of CEO Kenneth Lay’s family were known to use the company’s jet fleet as a sort of personal taxi service. But Adelphia and Enron provide only anecdotal connections between the use of jets and potential damage to shareholders. I set out to determine if there was, in fact, an empirical link between CEOs’ use of corporate jets and corporate performance. The results were striking. In the short-term, shareholders react negatively to the news that CEOs are using corporate jets. 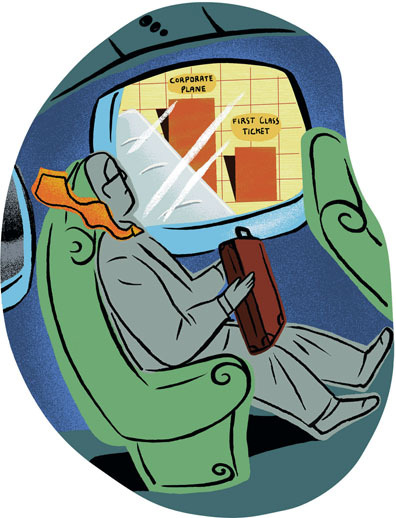 While CEOs who fly on such aircraft may arrive at their destination quickly, their stocks lag. The shares of companies whose CEOs use private aircraft under-perform the market by more than 400 basis points per year. In a sense, this effort was a matter of putting two theories of executive behavior and compensation to the test. In their classic 1976 study, Theory of the Firm: Managerial Behavior, Agency Costs and Ownership Structure, Michael C. Jensen and William Meckling, of the University of Rochester, used perquisite consumption by managers as the basis for their formal model of the agency costs of outside equity in a public corporation. When an owner-manager sells stock to the public and reduces his ownership below 100 percent, incentives increase for the manager to expend corporate resources for personal benefit. Jensen and Meckling’s model seems to predict that perk consumption by a CEO should vary inversely with his fractional ownership of the company (that it would rise as a CEO’s stake in the publicly-held company he runs falls). They also suggest a manager’s personal tastes and the difficulty of monitoring the manager’s actions would influence perk consumption. In his 1980 paper, Agency Problems and the Theory of the Firm, University of Chicago Finance Professor Eugene Fama took a more benign view of perquisites. “Consumption on the job” by managers amounts to a form of compensation that can be offset through adjustments in salary or other forms of pay. Fama described the interaction between managers and their boards of directors in terms of a dynamic of “ex post settling up,” in which the manager’s wage is regularly revised to account for his performance and his personal consumption of company resources. Fama’s model implies that perk consumption represents an agency cost only to the extent that its value exceeds the subsequent consequences to the manager from ex-post settling up wage revisions. Fama’s theory, then, appears to predict an inverse association between perk consumption and compensation, controlling for other attributes that affect compensation such as industry, performance, and experience. In other words, perk consumption would fall as compensation rises. I tested both theories by investigating the prevalence of a major perk – the use of corporate jets – and then measuring its relationship to other factors such as overall compensation, CEO characteristics, and shareholder return. Data for this study was drawn from a panel of 237 Fortune 500 companies between 1993 and 2002. The final sample had 2,340 observations, with most firms appearing in the sample for 10 full years. Those observations covered 485 individual CEOs, a small handful of whom served more than one term with the same company. The sample firms had median annual sales of close to $7 billion, median total assets above $10 billion, and a median market capitalization close to $8 billion. Table 1 contains data on the characteristics of the CEOs in the study. The typical CEO was about 58 years old, with a mean ownership of about 1.5 percent of the firm’s shares. CEOs received mean cash salary and bonus compensation of about $2.1 million, and additional annual income from stock option and restricted stock awards. Stock options delivered a large, skewed distribution of compensation, with a mean of $4.5 million and a median of $1.6 million. t is impossible to measure the tastes and performance of CEOs directly. However, I was able to collect two variables about the backgrounds of my sample’s 485 CEOs that one might expect to exhibit correlations with their perk preferences: political affiliation and education. First, I chose CEOs’ political affiliations, which can be observed from databases of donations maintained by the Federal Election Commission. I classified CEOs as either Republicans or Democrats if a clear majority of their donations were directed to one party’s candidates or organizations. Fifty-five percent of the CEOs appeared to be Republicans and 19 percent, Democrats. An additional 19 percent donated fairly evenly to both parties, and the rest had no record of political donations. Second, I chose CEOs’ educational backgrounds, which were provided by Forbes magazine’s annual executive compensation surveys and supplemented when necessary by online news searches. Six percent of the sample CEOs had no college degree, but a majority had attained a graduate degree of some type. Next, I measured CEO perk consumption – a complex and occasionally difficult task. The primary source of information was the companies’ annual proxy statements. 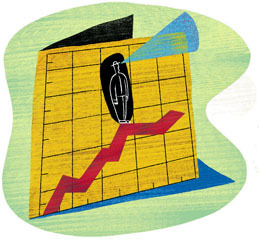 Data on perks usually appear in proxies as a footnote to column (a) of the Summary Compensation Table, headed “Other Annual Compensation.” The total value of perks must be disclosed based upon their “aggregate incremental cost” to the company, but only if the total exceeds the lesser of $50,000 or 10 percent of the executive’s salary plus bonus. Companies must itemize the cost of any individual perk, such as personal aircraft use, if it exceeds 25 percent of the overall perk total, assuming that the total exceeds the $50,000 threshold. The structure of the Securities and Exchange Commission’s disclosure rules causes data for CEOs’ personal aircraft use to be censored. For example, assuming the CEO earns at least $500,000 salary plus bonus, firms never have to disclose aircraft use if its cost lies below $12,500 (equal to 25 percent of the $50,000 overall threshold). From reading a large number of proxy statements, it is evident that several disclosure loopholes limit the transparency of perk consumption data. ven so, I was able to amass a large amount of data on CEO perks, which is described in Table 2. Perks are rank-ordered according to the frequency of their disclosure. Companies use certain euphemisms to describe personal aircraft use, such as “travel expense” and “corporate transportation.” I generally assumed that such language refers to airplane or helicopter travel rather than limousines, trains, or boats, unless disclosures indicate otherwise. As Table 2 indicates, aircraft use is by far the largest disclosed CEO perk, appearing more than twice as often as the next most popular item, financial counseling, which includes tax preparation, estate planning, and the cost of representation in contract negotiations. 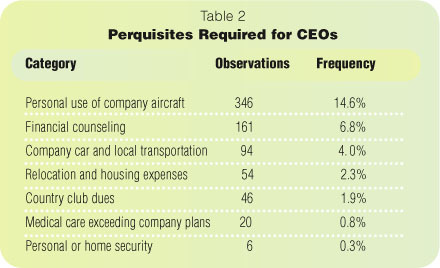 The median cost to the company of CEO’s personal aircraft use, when disclosed, is a little more than $50,000. While costs of operating different aircraft vary greatly, The New York Times, using data from Executive Jet Inc., the leading time-share company, in 2001 estimated the hourly cost of leasing an eight-person Cessna Citation V aircraft was $10,000 – or $2,500 per person if the CEO on average travels with three other passengers. A CEO with $50,000 in reportable aircraft use would therefore spend about 20 hours per year in the sky, enough for perhaps three round-trips between New York and Florida, for example. What determines whether a CEO has a higher propensity to use corporate aircraft? I used a Tobit regression model to analyze how the cost of CEO aircraft use in each firm-year is related to a range of explanatory variables. 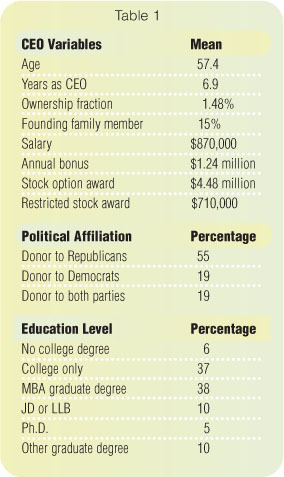 Among the variables I chose were CEO stock ownership, compensation, the age of the CEO, whether or not he was a member of the firm’s founding family, education level, and political affiliation. The regression model includes control variables for size and capital structure. hen I ran the models, the estimates for the excess compensation residual were negative. That provided some support for Fama’s theory about perk consumption, since it implies that a CEO’s compensation is adjusted downward when his perk consumption increases. But the effect was very small. The result implied that an additional $1,000 in perks consumed by the CEO leads to a reduction in compensation of 10 cents, an economically negligible amount. The Jensen-Meckling theory of perks predicts that CEOs trade off the value of perk consumption against the reduction in personal ownership value entailed by that same consumption. When I estimated the model, the CEO ownership variable provided evidence of the predicted negative association with perk consumption. The estimates imply that increases in ownership act as a curb against perk consumption at both low and high ownership levels, but that greater ownership provides protective cover that CEOs use to extract greater perks over a middle ownership range. The overwhelming majority of CEOs in this sample lay in the low ownership range. Again, the effect was very small. The marginal effect implies that a 1 percent rise in CEO ownership leads to a $5,030 reduction in perk consumption, which seems quite small compared to the cost of the additional equity investment – $201 million in the mean sample firm. Variables associated with CEO tastes and preferences have clear impacts upon patterns of corporate aircraft use. Older CEOs are more likely than younger ones to make personal use of company aircraft. This pattern may arise due to increasing frailty of CEOs as they age, or it may represent opportunism by CEOs who consume perks heavily near the end of their careers with reduced fears that ex post settling up wage revisions will permanently impact their compensation. CEOs from founding families also use corporate aircraft with abnormally high frequency, perhaps indicating that founders do not recognize boundaries between personal and corporate property as clearly as non-founders. Political affiliation has some impact upon perk consumption, but in a non-partisan way. CEOs who make no political donations are the heaviest users of corporate jets, while CEOs who make donations to both parties are the lightest users. CEOs who clearly are Democrats or Republicans fall somewhere in the middle. Finally, the education variable results were striking. CEOs with the least education (no college degree) are the heaviest aircraft users, while those with the highest advanced degrees (Ph.D.s) are the lightest. CEOs who hold MBAs or other masters degrees are somewhere in between, and CEO-lawyers have significantly higher aircraft use than normal, though not as high as non-college graduates. How does aircraft use affect stock prices? In my 1993-2002 sample of 237 firms, 63 companies disclosed no CEO aircraft use for either of the first two years and then began disclosing it for some future year or years. I calculated the mean cumulative abnormal stock returns (CAR) for these 63 firms beginning two weeks – or 10 trading days – prior to the statement date of the proxy in which corporate aircraft use was first disclosed. I extended the event window until one day after the filing day because some firms may post their documents after the market closes. The results: stock prices exhibit essentially zero change until one week before the event day, at which point they begin to trend downward, with the mean showing a CAR of -1.99 percent. loss of 2 percent in market capitalization was worth about $150 million for the median firm in the sample, far in excess of the disclosed incremental cost to the company of a CEO’s personal aircraft use. If shareholders view the entire corporate aviation activity of a firm as a deadweight cost that yields no compensating benefits, and if one factors in additional costs for storage, maintenance, fuel, and operation of the plane, then the dollar loss in shareholder wealth could approximate the true present value cost to the firm of acquiring an aircraft and making it available to the CEO for both business and personal travel. The CAR results indicate that shareholders do not welcome the news that firms permit CEOs to use corporate aircraft for personal travel. When I ran regressions that took into account compensation and ownership levels, I found that shareholder reactions to CEOs’ corporate jet use are mitigated if the CEO earns lower compensation. This pattern is consistent with Fama’s perspective, that perks are benign if offset by reductions in other forms of compensation. Short-term, stockholders plainly view the use of a corporate jet as a negative. Next, I assessed the ongoing market performance of firms that permit their CEOs to have personal use of corporate aircraft. Again, the results were negative. The results indicate that firms with CEO aircraft use under-perform the market by more than 400 basis points per year, equal to a shortfall of about $300 million in market capitalization each year for the median sample firm. Given that these performance shortfalls equal hundreds of millions of dollars per company per year, it would be difficult to argue that the direct costs of perk consumption alone could explain the gap. Even the most expensive jets don’t cost several hundred million dollars. One clear possibility is that these managers who use jets frequently also run their firms inefficiently, tolerating waste, excess overhead, or uncompetitive cost structures. When I ran regressions of firms’ return on assets against the aircraft use dummy variable, as well as dummy variables for industries and years, I found a negative association between profitability and the aircraft use variable, and a strong, significant negative association between the aircraft variable and sales per employee. These regressions indicate that firms with high CEO perk consumption also tend to be over-staffed relative to the competition, as they achieve $30,000 to $40,000 less in sales per employee. The inverse relationship between CEO aircraft use and company performance appears surprisingly strong and much larger than could be explained by the direct cost of the resources consumed. It could be that CEOs who consume excessive perks may be less likely to work hard, less protective of the company’s assets, or more likely to tolerate bloated or inefficient cost structures. High executive perks might also occur due to weak corporate governance. For many in the world of business, the corporate jet is the ultimate sign of arrival. When they’re able to fly in a Gulfstream IV out of Teterboro Airport in New Jersey instead of having to wait in line to board a Boeing 737 at La Guardia, many executives feel as if they have finally made it. For shareholders, ironically, this moment frequently signals it’s time to head for the exits. David Yermack is associate professor of finance at NYU Stern.